New Orleans As part of Paladin Partners, Drummond Pike and I spent an invigorating and productive day meeting in Washington with Carlos Saavadra and Gaby Pacheco, two of the principle organizers behind the courageous and expectation-challenging push for the DREAM Act, which culminated in a near miss in Congress late in 2010. It is fair these days to describe a lot of the work around critical immigration reform as stalled and stuttering as the forces of reform count the bleak prospects for a vote in Congress and try to reposition and find consensus for a future. 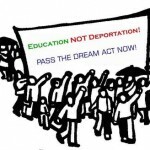 Not so for proponents for the DREAM Act. This is not to say that some of the troops around the country are not demoralized and depressed, but is to say that the organizers are still moving aggressively and adamantly refusing to accept the possibility of delay or defeat. Talking to Gaby and Carlos only days past their meeting with over 200 student activists from the United We Dream chapters in Memphis, the old axiom of organizing that acknowledges that when you have a real base, there’s never a choice but to keep fighting was proven once again. The DREAM team understands that the political stalemate in DC does not dictate the strategy, but whether or not they can build the movement, the heat, the leverage, whatever one might call it, to trigger the change both locally and nationally. Below the radar for example the visibility and inspiration produced in 2010, have inspired half a dozen fights even in these times of austerity to provide tuition for DREAM-type immigrant students at the state level in places as diverse as Maryland and Colorado. And, bet on this, they will hang some new scalps on their belt in some of these states, which will help recharge the movement. As exciting to me is the fact that they are thinking deeply and strategically about ways to continue to force their “story” (as Gaby continually called it) into the political and cultural equation at the grassroots level in 30 or more locations around the country in coming weeks and months. The stories are compelling, because there is no way to get around the fact that these young people are the classic “innocent victims” of our national systemic policy failure. Planted in a country through no agency or action of their own, they do their best to adapt and succeed in the new country’s terms until they hit the wall or in many cases the very high ceilings of their aspirations. Then everything comes down to their status and it is hell to pay. In building a movement the first key ingredient is the ability to establish “moral superiority,” and this they have in spades. I wouldn’t bet against them when you look closely at their record to date and when you consider their desperation. They don’t have time to wait, especially given the astronomical increases in deportations under the Obama Administration. Before meeting the DREAM organizers I had a cup of coffee with a colleague working with Casa de Maryland, the huge immigrant rights and service organization. She had a perfect metaphor for the crises in immigration reform. She described all of us as reaching out of the water to grab at the reform being waved above our hands by the Obama Administration (think Tantalus in the classic Greek myth going for the grapes) and finally looking down to find that we had been eaten away from legs to waist by the deportations in the immigrant community while our eyes were skyward. They have a shrewd fightback strategy on the deportations and the solid understanding that this is something that President Obama can and should do and the willingness and urgency to push him hard and directly to make it happen. They are counting their friends and targeting their enemies and organizing widely and deeply outside of DC, in fact Carlos though still executive director of United We Dream has relocated back to Boston to keep it real. We’re betting they can keep the DREAM alive, and so should you! This entry was posted in Ideas and Issues and tagged Carlos Saavadra, Casa de Maryland, deportatoins, DREAM Act, Drummond Pike, Gaby Pacheco, immigration reform, Paladin Partners, President Obama, United We Dream by wade. Bookmark the permalink.